Dr. S.M. Junaid Zaidi H.I., S.I. has rich and diverse experience spanning over forty years, ranging from the field of international and national organizations, educational institutions, research and teaching to foreign collaborative ventures. 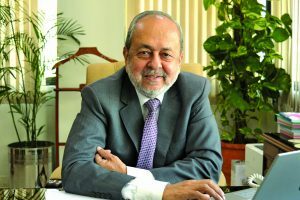 He has been the founding member of COMSATS University Islamabad (CUI), which under his stewardship as its first Rector since inception in 2000, has grown into an institution with sound and creditable reputation both nationally and internationally. CUI has expanded nation-wide with seven physical and one virtual campus. In addition internationalization of the CUI programmes has grown exponentially, with the dual degree programme with Lancaster University being the hallmark of the numerous initiatives. Dr. Zaidi has expertise in Information Technology, Project Planning and Management, Industrial Information Networking, Operations Research, System Designing, Technology Policy Analysis, Technology Utilization and Commercialization, Technology Monitoring and Forecasting, Technology Transfer, Build-Operate-Transfer (BOT) Mechanism. His experience with the UN included setting up of the National Bureau of the UNDP’s project “Technology Information Pilot System (TIPS) in Pakistan. He has also served as Advisor to the United Nations’ ESCAP, APCTT for three years and had undertaken several missions to the countries in Asia and Africa in his capacity as the UN-expert on Information Technology. In addition to establishing Industrial and Technology Information System in Tanzania he was a member of the six-member team of international experts to review the Industrial Technology Development Policies and Strategies and proposed a long term Plan for the Government of Ghana. Dr. Zaidi has participated as a resource person in a number of meetings and conferences and other events organized by the UN. In recognition of his uninterrupted service to society, the Government of Pakistan twice conferred the prestigious national awards of Sitara-i-Imtiaz in 2007 and Hilal-i-Imtiaz in 2014. Also in recognition of his continued contribution for the promotion and development of Information Technology, the NCR Corporation has awarded Dr. Zaidi the “IT Pioneer 1987-1995” in the year 2001 which is one of the highest IT award. The prestigious University of Lancaster also conferred on Dr. Zaidi an honorary doctorate degree in 2012 for his unmitigated service for promotion of transnational education.